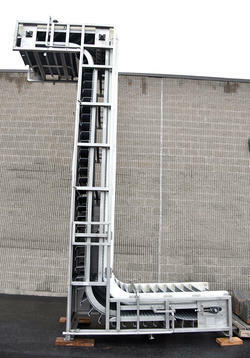 An FMC vertical frame Z-type stainless steel incline and feed elevator belt, with 31 inch wide cleated belt, with deep cupped cleats providing the functionality of a bucket elevator conveyor. Horizontal infeed and discharge sections allow versatility for loading this conveyor, as well as for feeding downline equipment, such as a radial combination scale. 5 foot long horizontal infeed section. 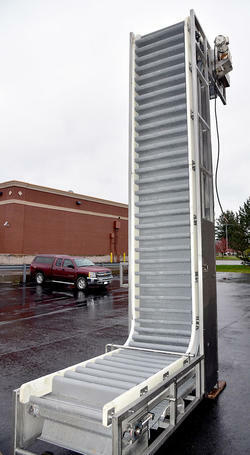 13 foot long vertical incline section. 5 foot long horizontal discharge section. 31 inch wide solid interlocking chain type plastic belt with 6 inch high by 2 inch deep "cupped" cleats on 6 inch centers. Belt runs between 6 inch high UHMW plastic side rails. 24 inch infeed height, 15 foot discharge height. 12 foot long floor footprint. Stainless steel back-side shrouds, easily removable for cleaning and sanitation. Air header over & under both infeed and discharge belt sections. Top mounted stainless steel 2HP chain drive motor. As of this writing, this Z-shaped elevating conveyor is in stock at ALARD, in EXCELLENT condition, available for timely shipment. CALL 315-589-4511 to confirm availability and discuss your food process feed conveyor needs. This page contains a single entry by Michael C. Shults, Alard Equipment Corp published on November 14, 2018 4:43 PM. Waukesha LOBE PUMP, model 30 with drive, Y3812 was the previous entry in this blog. Food METAL DETECTOR with CONVEYOR, 13x12, stainless steel, Y3951 is the next entry in this blog.